Portugal is a hospitable country, with good opportunities to live and study! With about 10 million inhabitants, is one of the oldest nations in the world, being independent since 1143. Result of its history, Portugal is a country of many singularities shaped by Roman, Visigothic and Suevas, Arab, African influences as well as an entire world that crave to discover in the fifteenth century. It was in this unique period in its history, in which “Gave new Worlds to the World” that Portuguese navigators traveled through the western and eastern coasts of Africa, opening up sea routes to India, Brazil, China and Japan, making the Portuguese one of the most spoken languages and of the Portuguese people one of the more open-minded to new cultures and civilizations. European Union member since 1986, Portugal is a modern country, endowed with good infrastructure and well connected to all other European countries, offering itself as an ideal gateway to Europe. Simultaneously, it continues to invest and upgrade its vast artistic and archeological heritage. With a rich cuisine and a vibrant cultural life, Portugal is the testimony throughout its long history. Portugal, meeting place of distant cultures maintains its own identity as a hospitable people, peaceful and friendly! 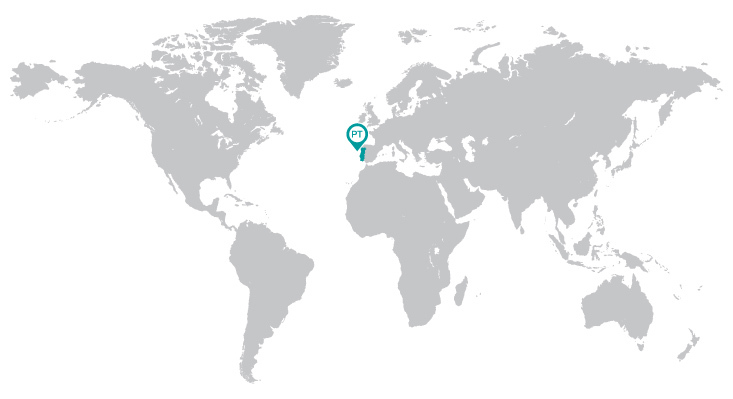 Located in the extreme southwest of Europe, surrounded by an extensive coastline on the Atlantic Ocean, limited at the north and east by Spain, and at west and south by the Atlantic Ocean. The territory of Portugal includes the Azores and Madeira islands. Portugal is one of the European countries with a warmer climate, with average daytime temperatures between 5ºC and 15ºC in winter and between 25ºC and 35ºC in summer. The summers are mild in the highlands of the north and in the coastal region of the far north and center. The autumn and winter are typically windy, rainy and cool, being colder in the northern districts and central provinces, where freezing temperatures occur during the colder months. The North records the highest rainfall and the lowest average and annual temperatures but it is in the interior region that take place the larger temperature ranges. At the south of Tagus River it is possible to felt the Mediterranean influences, with very hot summers and short winters and little rainfall. Madeira Island has a Mediterranean-type climate with mild and pleasant temperatures throughout the year, while the Azores have a temperate maritime climate with abundant rainfall. The official language is Portuguese. Portuguese Constitution emphasize freedom of expression, religion and conscience. Churches and religious communities are separate and independent of the State. For historical reasons, which come from the foundation of Portuguese nationality, the Catholic Church plays a central role. Portugal’s currency is the Euro. From January 1st, 1999, Portugal, and most other 10 Member States of the European Union (Belgium, Germany, Spain, France, Italy, Luxembourg, Netherlands, Austria, Finland and Ireland), adopted a single currency – the Euro, which came into circulation on January 1st 2002 and whose symbol is €. Take a glimpse to the average monthly cost of living for a student from the IPLeiria. Portugal’s privileged geographic situation makes it a point of entrance in Europe and a scale point of many foreign air companies. Taxi to the Bus Terminal of Sete Rios (Rede Nacional de Expressos) in Sete Rios. In public telephone booths it can be used coins and special cards that are for sale in Telecom Portugal shops, post offices and in some kiosks and tobacconists (each one properly identified). Proof of survival means or scholarship. With the opening of a bank account, you will be entitled to a debit card that will allow handling the account in agencies or electronic boxes or and also make payments and purchases. Banks are opened on Monday through Friday, from 8:30 to 15:00 and closed on weekends and public holidays.